Movie Review: 'Now You See Me,' Directed By Louis Leterrier A new gang caper film — populated by the likes of Woody Harrelson, Mark Ruffalo and Michael Caine — makes promises it can't deliver. An FBI agent and and Interpol detective chase thieving magicians called the Four Horsemen, but a portentous tone and redundancy outweigh the action and flash. Magic is compelling when it actually amazes, accomplishing the difficult feat of freeing its viewers from disbelief and letting them bask in the wonder of seeing what they know is impossible. Movies work the same way, and part of the equation for both is developing the right expectations. The promised experience may be good, but if you state firmly that what you're about to see is going to be the most sensational trick ever performed or that the movie you're about to see will constantly keep you on your toes, upend every expectation you have and change your entire worldview, you may be overselling it. Now You See Me, a con movie with magic as its vehicle and twists fueling its forward motion, exudes self-importance and can't help but make promises it can't deliver on. In a prologue breathless with wonder, four magicians are recruited to be part of something larger in a slick rounding-up-the-crew sequence that reveals the beginning of a con but not who's doing the recruiting. 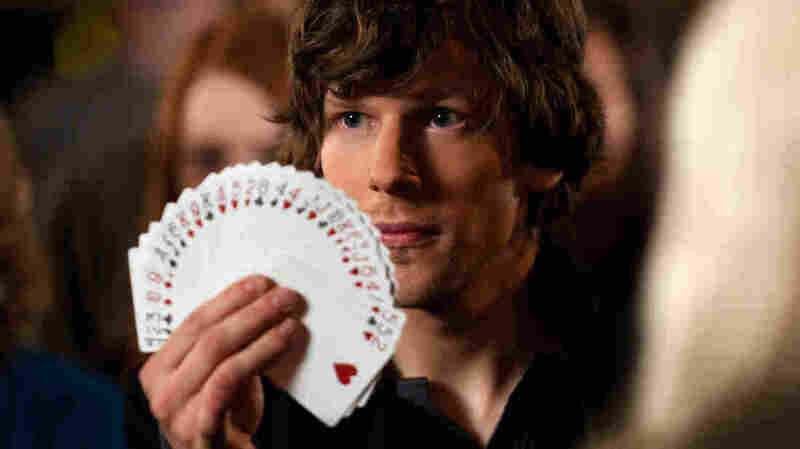 J. Daniel Atlas (Jesse Eisenberg) is an arrogant show-stealer performing large-scale tricks, and Merritt McKinney (Woody Harrelson) is a charming mentalist adept in hypnosis. Henley Reeves (Isla Fisher) is Atlas' former assistant, now performing solo and subverting expectations as a damsel in distress and rescuer. And Jack Wilder (Dave Franco) is an up-and-comer with a talent for picking locks and pockets. When they all meet, we're just as in the dark as they are. Cut to a year later when the magicians, now calling themselves the Four Horsemen, are headlining a packed show in Vegas and promising to do something never before seen. If you've never seen magicians steal 300 million euros from a bank vault in Paris and let it loose thousands of miles away, this qualifies. When the trick is over, the magicians are all too easily caught by the FBI and assigned to agent Dylan Rhodes (Mark Ruffalo), who's frustrated to be saddled with a case that can't help but make him look foolish and an Interpol agent named Alma Dray (Melanie Laurent) who's demanding to be included in the investigation. In questioning each magician, Rhodes finds himself thoroughly outmatched. Atlas lives up to his reputation as the smartest man in the room, a Mark Zuckerberg of magic. And in a delightfully one-sided encounter that proves Harrelson's mentalist deserves his own movie, McKinney learns much more about Rhodes than the reverse. It's a fun scene that establishes a playful cat-and-mouse game you'd hope to see played out over the rest of the movie, but when the FBI is forced to release the Horsemen, the magicians fade to secondary roles and Rhodes becomes the protagonist. After being bested in the interrogation room, Rhodes commits himself to taking the magicians down, and for a while the choice to focus on the cop trying to outwit the con artists is an interesting one. It gives more screen time to Rhodes' partnership with Dray, a relationship that plays close to the Mulder/Scully dynamic, with Rhodes the skeptic and Dray excited by the ideas magic represents. Their easy chemistry grounds the rest of the silliness, and even the quickly moving plot, mostly eager to barrel ahead to the next twist or lens flare, has sense enough to breathe and let the two talk. Unfortunately, the choice to follow Rhodes often renders the experience a con movie seen from the most boring angle, that of the ineffectual cop constantly a step behind. There's only so many times Ruffalo can play the role of the desperate man shaking down a street magician for his secret — while too frustrated to notice he's getting his own pocket picked — before the gag wears thin. A cast of ancillary characters includes a barely used Michael Caine as Arthur Tressler, wealthy financier of the Horsemen, and an underdirected Morgan Freeman as Thaddeus Bradley, a former magician now making his money exposing other magicians' secrets. While the FBI is baffled, it takes no time for Bradley to confidently divulge how the Horsemen pull off their heists. Freeman's golden-voiced Bradley is a little too omniscient and a little too trustworthy for the two-bit shyster that he's written to be, and his explanations, accompanied by lengthy cutaways, repeatedly send the movie into redundant wheel-spinning. It's as if the slick reveal at the end of Ocean's Eleven happened every 20 minutes. It's all a little dumb, but the movie boasts several non-CG tricks and a few genuinely mesmerizing set pieces including a hand-to-hand-to-magic combat scene between Ruffalo and the spry Franco. Toward the end, just about everything loses its sparkle when it's hinted that the Horsemen aren't even the architects of their tricks, just pawns executing a plot designed by someone else. An ending far sillier than anything that comes before nearly unravels the whole thing; it's not quite as bad as "it was all a dream," but is just as unbelievable and dismissive of one's investment in the experience. Better movies on magicians have emphasized the trust necessary in the relationship between performer and audience. Now You See Me might be forgiven for underdelivering on its grand promises if it also didn't treat its audience with smugness. You wouldn't be blamed for taking up with Ruffalo's character and just wanting to shake down the filmmakers for your money back.